Celebrating Russia’s legendary ballet school whilst paying tribute to its iconic dancers. The Russian Ballet Icons Gala is an annual multimedia experience in London, organised by Ensemble Productions since 2006. Every one of these special events has celebrated Russia’s legendary ballet school whilst paying tribute to its iconic dancers. 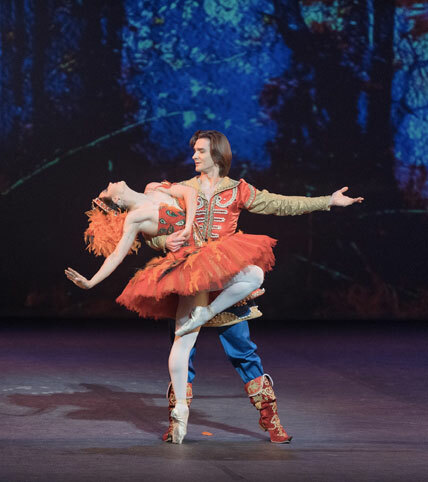 The 2018 Gala once again was a fascinating display of Russian classical ballet repertoire with much-loved masterpieces including La Bayadère, Swan Lake, Don Quixote, Giselle, Sleeping Beauty, Cinderella and contemporary choreographies. There were London and world premieres including A Flashback by Mariinsky-based choreographer Ilya Zhivoi, Warrior of Light by the unique ballet family Maria Sasha Khan and Nadia Khan, and Julian and Nicholas McKay under the umbrella of the Theatrum Vitae cultural platform. Vladislav Lantratov and Maria Alexandrova become Rudolf Nureyev and Margot Fonteyn in a pas de deux from the Bolshoi’s Nureyev, the talk of the town in Russia’s contemporary dance scene. Stanislaw Wegrzyn, winner of the Prix de Lausanne 2017 and now apprenticed with the Royal Ballet, will also be taking part in the Gala. The Gala featured performances by Maria Alexandrova (Bolshoi Theatre), Roman Belyakov (Mariinsky Theatre), Sergio Bernal (Ballet Nacional de España), Audric Bezard (Ballet de l’Opéra de Paris), Federico Bonelli (The Royal Ballet), Claudia D’Antonio (Teatro di San Carlo), Dorothée Gilbert (Ballet de l’Opéra de Paris), Francesca Hayward (The Royal Ballet), Maria Sascha Khan, Nadia Khan (Teatro dell’Opera di Roma), Kimin Kim (Mariinsky Theatre), Ekaterina Kondaurova (Mariinsky Theatre), Ekaterina Krysanova (Bolshoi Theatre), Vladislav Lantratov (Bolshoi Theatre), Julian MacKay (Mikhailovsky Theatre), Nicholas MacKay, Natalia Osipova (The Royal Ballet), Artem Ovcharenko (Bolshoi Theatre), Xander Parish (Mariinsky Theatre), Giuseppe Picone (Teatro di San Carlo), Dmitry Semionov (The Semperoper Dresden Ballett), Polina Semionova (Staatsballett Berlin), Oxana Skorik (Mariinsky Theatre), Anna Tikhomirova (Bolshoi Theatre) and Stanislaw Wegrzyn (The Royal Ballet). The Gala was accompanied by the English National Ballet Philharmonic Orchestra under the direction of Valeriy Ovsyannikov. Production photography by Marc Haegeman.